The eastern end of Commercial Road is pretty shabby. 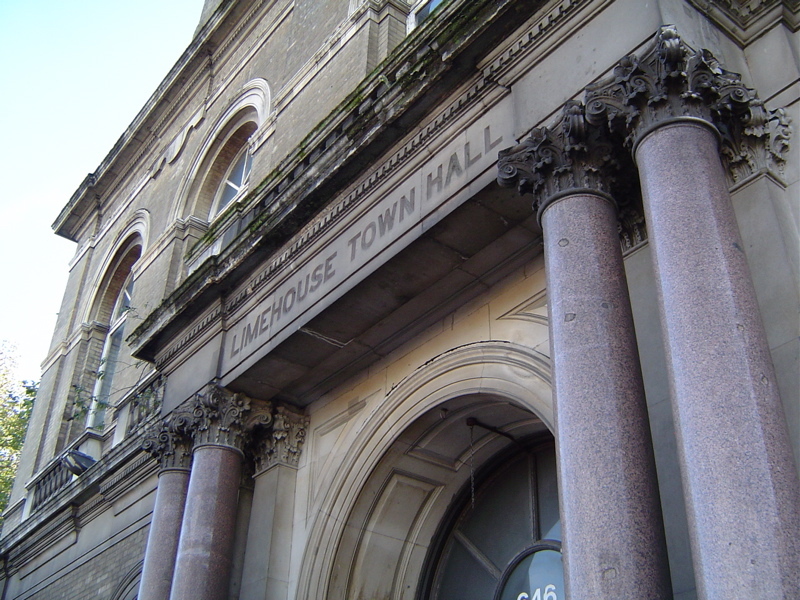 It’s easy to overlook the Limehouse Town Hall. It’s not the grandest municipal edifice in any case but give it some attention – it captures the dreams of our early city fathers. And its former grandeur, colourful history and present disrepair tell a story which charts those fraying dreams over many years. Plans for a new building that would reflect the status and aspirations of Limehouse local government were first mooted in 1875. The Limehouse Vestry – the closest the area came then to a local council and responsible for local drainage, paving, street repairs, lighting and the removal of nuisances – wanted a permanent home. That home was planned as a building to ‘dignify the proceedings’ of the Vestry board: ‘something more than four walls and a roof’ – it was to be ‘a structure that from an architectural point of view shall do honour to the parish of Limehouse’. It was also envisaged as a venue – much needed by a rapidly growing local population – for large public meetings and events of all kinds. Six years and some £10,000 later, the hall was opened: ‘a substantial rectangular structure, of Italian style, with a bold open portico carried on polished granite columns [with] facades of white Suffolk brick and Portland stone with bold round arched windows’. The local newspaper reported both the ‘cheers and some slight hissing’ which greeted his remarks, the dissent probably reflecting an electorate not wholly convinced of the value of all that expense. Other accounts describe tables, writing stands, hat stands, even the boxes to contain lavatory paper made of mahogany, chairs covered in morocco leather, Persian rugs on the main ground floors and a rosewood grand piano gracing the main assembly hall. What is certain is that the hall – taken over by Stepney Borough Council in 1900 – was well used over many years. Local people attended balls and concerts in numbers straining even the modest health and safety regulations of the era. ‘Cinematograph’ showings were held into the 1920s. In a district known for its fierce partisanship, politics loomed large too. Gladstone was received with plaudits and unemployed protests in 1888. The radical MP Charles Bradlaugh spoke the following year. 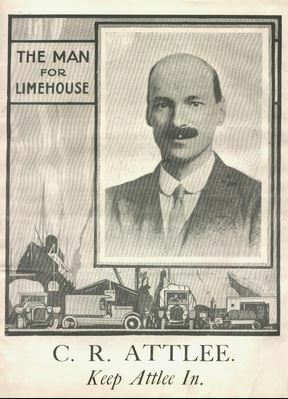 Clement Attlee, a one-time mayor of Stepney and a Limehouse MP from 1922 to 1950, visited frequently. He survived even the crisis election of 1931 and a particularly rowdy Town Hall meeting which saw the Conservative candidate greeted with boos and a rendering of The Red Flag from ‘malcontents in the gallery’. But there was a ‘hostile element’ for Attlee too that year and his majority fell to just 551 (or 2.4 per cent); in 1945 it would be 6780, 68 per cent. The heyday of the Town Hall as an administrative centre, however, was relatively short. An infant welfare centre replaced the vestry hall and committee room on the ground floor before 1931. A doctor’s surgery followed. The building – alongside much of the rest of this docklands area – was badly damaged in the Blitz. It was reopened in 1950 by no less a person than then Prime Minister Attlee. Attlee’s government had done much – through the best of motives – to deprive local authorities of many of their more significant powers in health, welfare and the utilities but in this setting he expressed his wish to ‘prevent overmuch centralisation’. ‘We want a real live active Borough with a sense of its individuality,’ he went on and added, ‘there is no more individual borough in London than Stepney’. There would be no great revival in the Town Hall’s fortunes, however. By 1975 it was essentially redundant and became, through the auspices of Stepney’s successor authority Tower Hamlets, the site of the new National Museum of Labour History. I visited the Museum myself in those days and, to be honest, it seemed – before the heritage industry took off and Lottery funding kicked in – a rather moribund and literally mildewed place: a labour of love but struggling. The Liberal Democrats won control of Tower Hamlets in 1986 and withdrew support – though financially the demise of the Greater London Council in the same year was a greater blow. The Museum closed and has since reopened more grandly in Manchester. Decentralisation was one part of the new and controversial Liberal Democratic administration’s platform and from 1987 the Town Hall became the Wapping Neighbourhood Centre. When Labour regained power in 1994, this ended and the building endured a number of short-life roles – at one time a shelter for homeless people, at another a young person’s training centre – until in 2004 it was taken over by the Limehouse Town Hall Consortium Trust. The Trust – which aims to redevelop the building ‘to bring it back into full and sustainable community use’ – has worked hard both to commemorate its past and revive its future. Important repairs have been completed; future phases will modernise and adapt the building to secure and expand its current use as a community venue for musical, drama and arts events of all types. Give it your support. And that is the uncompleted story of Limehouse Town Hall – not the most imposing building but impressive nonetheless; playing no decisive part in history but a witness to local dramas speaking of striking political and social change; and – through many vicissitudes – a part of its community for one hundred and thirty years and for some years to come. A big thank you to the Limehouse Town Hall Consortium Trust who provided me with a wealth of information and resources on the Town Hall after my visit during London’s Open House weekend in September 2012. Most of the quotations above come from contemporary newspaper reports. The website of the Limehouse Town Hall Consortium Trust will tell you much of the building’s past, present and anticipated future. The building was also a synagogue according to a few local Jewish visitors, it was also a Boxing Club, BT Exchange and a whole host of other things including the first building in the UK to have blinds. Though we’re not sure how accurate that last statement is. Thanks for the additional information, Sam. I hope the links you’ve added will get more people involved and interested with what’s going on now. Good luck!